We can manufacture a variety of Remembrance Plaques using either indoor or outdoor acrylic material with sizes up to 635 x 430 mm. The outdoor material is reputed to last up to 35 years. Plaques can be supplied with a heat resistant double sided tape attached to the back or customers may choose to use some other form of fastening. A sample design and price can be supplied prior to confirmation of the order. 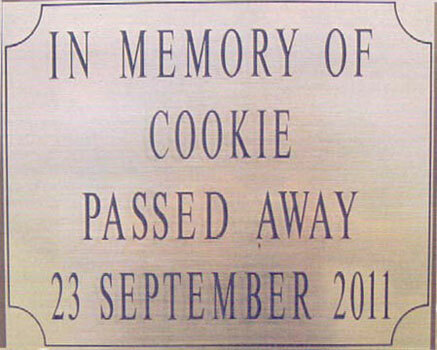 This plaque is manufactured in Acrylic Brushed Gold outdoor material. 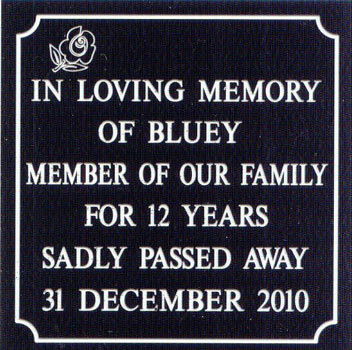 This plaque is 90mm x 90 mm in size and engraved on Glossy outdoor material.